Did you notice on the front cover that the friends are looking at an actual photograph and not an illuminated smart phone? This is old school love and friendship, feline style. 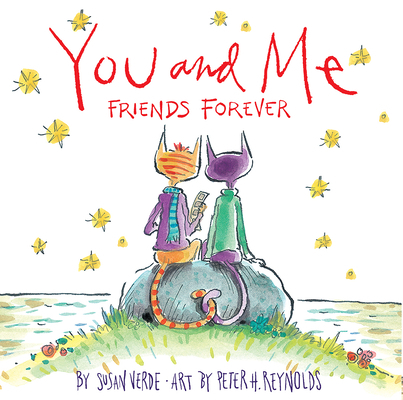 The rhyming prose makes this a fun book to read aloud, while the illustrations add another thousand words of friendship, caring and the power of chance encounters. Susan Verde is the author of many picture books for children, including I Am Yoga,Rock ‘N’ Roll Soul, and The Water Princess. She is a licensed yoga instructor and lives in East Hampton, New York. Peter H. Reynolds is the renowned illustrator behind the bestselling Judy Moody and Stink series, as well as many other award-winning picture books, including The Dot and Ish. He lives in Dedham, Massachusetts. "Perfect as a gift book exchanged between kindred spirits, this could also spark interesting conversations about the role of chance in our lives." "...the small trim size may give the book its strongest audience among gift-giving adults, though children will have no trouble appreciating it." "This title is a wonderful introduction to the concept of serendipity and the magic of true friendship."